Jesse Eisenberg is an American actor. He made his screen debut with the comedy-drama television series Get Real from 1999 to 2000. After his first leading role in the film Roger Dodger (2002), he appeared in such films as The Squid and the Whale (2005) and The Education of Charlie Banks (2007). In 2008, Eisenberg was honored alongside Olivia Wilde with the Vail Film Festival Rising Star Award. In 2009, he starred in the comedy drama Adventureland and the horror comedy Zombieland, for which he won critical acclaim. He then played Facebook co-founder Mark Zuckerberg in The Social Network (2010), for which he received a Golden Globe and Academy Award nomination in the Best Actor category. Since then, he voiced the lead role in Rio (2011), and starred in the adventure comedy 30 Minutes or Less (2011). Eisenberg was born in Queens, New York City, the son of Amy, who worked as a clown at children's parties, and Barry Eisenberg, who ran a hospital and later became a college professor. He has two siblings, Hallie Kate Eisenberg, a former child actress who was once famous as the "Pepsi girl" in a series of commercials, and Kerri. He was raised in a secular Jewish family that originated in Poland and Ukraine. Eisenberg grew up in Queens and East Brunswick Township, New Jersey, attending the East Brunswick Public Schools at Frost School, Hammarskjold Middle School, Churchill Junior High School, and spending his sophomore year at East Brunswick High School. Eisenberg struggled to fit in at school and began acting in plays at the age of 10, stating "when playing a role, I would feel more comfortable, as you're given a prescribed way of behaving." Eisenberg studied contemporary architecture at The New School in New York City's Greenwich Village neighborhood. Originally, he had applied and was accepted to New York University, but declined enrollment in order to complete a film role. 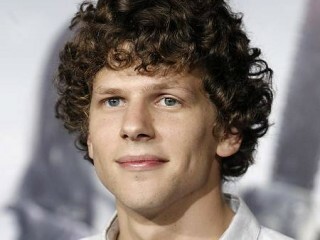 View the full website biography of Jesse Eisenberg.